Anglers visiting Sarasota and her beaches might like to try some Siesta Key snook fishing. Snook are caught all year long using a variety of techniques. Snook are the premier inshore game fish in Florida. They grow large, up to 40 pounds. Snook will hit both live and artificial baits. They can be very aggressive or frustratingly fussy. Snook are challenging, but rewarding. Snook are available all year long. Many clients choose to try Siesta Key snook fishing when on one of my Sarasota fishing charters. I have been running a bunch of family fishing charters this summer. Most of these trips include children and novice anglers. This limits the kind of fishing that I can do. It is difficult to do Siesta Key snook fishing with four anglers. However, the other day my client received a surprise! We were chumming with bait fish for speckled trout in six feet of water in the open bay. Mitch got a bite and the fish dumped the spool! I fired up the engine, pulled the anchor, and chased it down. I thought it was a shark, but turned out to be a big Sarasota snook! They are rarely caught in open water like that. Snook are schooled up pretty thick in the passes and out on the beach. Candice headed out on Sarasota Bay on a Sunday afternoon with her step-father to do a little tubing, a little fishing, and enjoy the afternoon on the water. The tide was running out hard and pass crabs were all over the surface. So, they netted a few up, dropped them to the bottom near some rocky structure in Big Pass, and before long she had her hands full with a large Siesta Key snook! It was a tough battle in the swift tide, but Candice subdued the fish, hoisted it up for a quick photo, and released her unharmed to go make babies. She landed several others as well. An over-slot snook caught at 2:00 on a Sunday afternoon? Yep. There is no doubt among anglers along the west coast of Florida that snook have made a rousing comeback since the big cold-water fish kill in 2010. 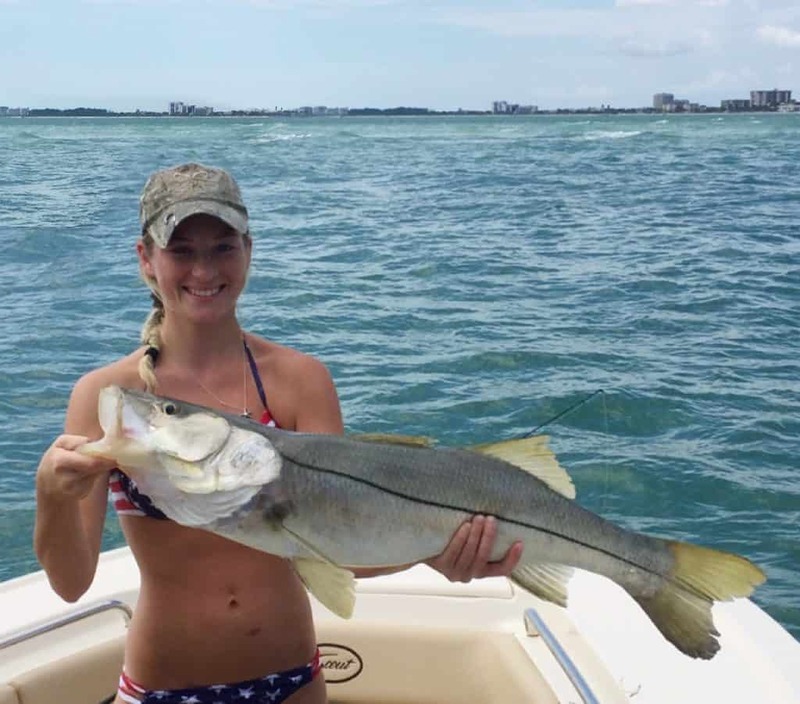 Some anglers credit several mild winters for the increase in snook numbers while others feel the strict management of the species is responsible for the great action. 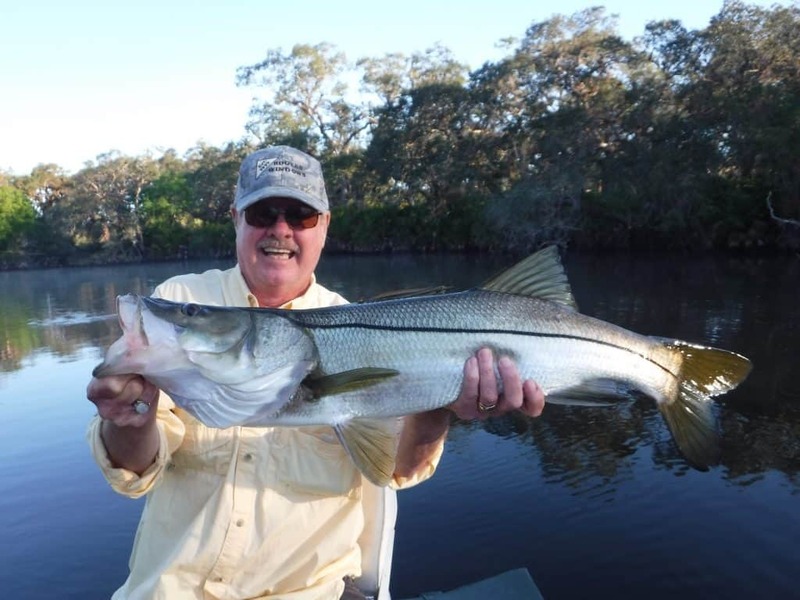 Whatever the reason, snook are pleasing fisherman throughout the region. As a guide in Sarasota, I am out on the water around 250 days a year. 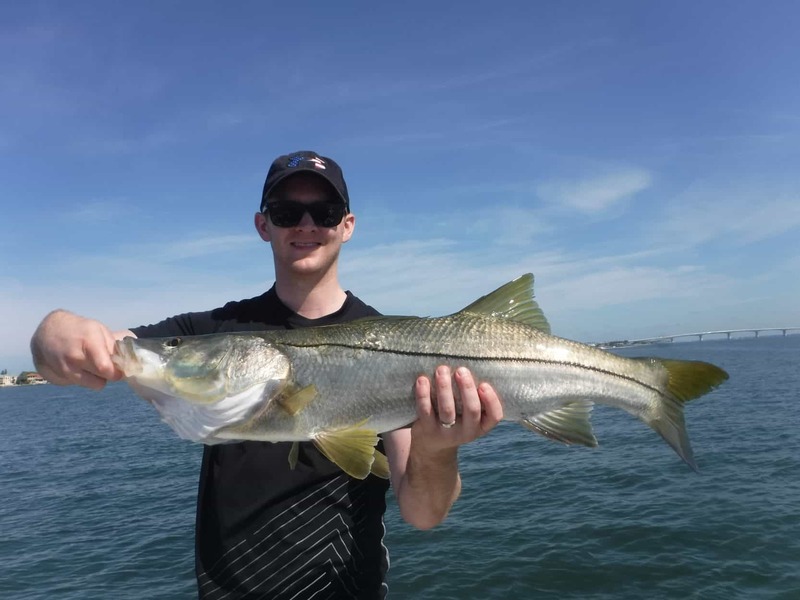 Clients on Sarasota fishing charters caught more snook this spring than they had in years, and in places that would not normally be associated with snook, especially open grass flats. Many of the snook are “schoolies” in the 16” to 24” range, but there are plenty of big fish around as well. Local snook migrations are pretty basic. They move into creeks, rivers, and residential canals in the winter to escape the extreme temperature fluctuations of the flats. As it warms up they migrate out into the inshore areas to feed up, then by early summer most fish are in the passes and out on the beaches in preparation of spawning. The pattern the reverses itself as the fish move back into the bays and eventually back into the creeks if it gets cold enough. Passes all along Florida’s west coast are full of snook of all sizes right now. Outgoing tides early or late in the day and at night are prime times to tame a line-sider. Live bait will usually produce the most fish. Large pilchards are a prime bait, but hand-picked shrimp, 3” pinsfish and grunts, and as Candice proved, even crabs will entice a hungry snook. Stout tackle is required when fishing in heavy current and around structure. Diving plugs and soft plastics bumped along the bottom will fool wily snook as well. Sight casting for snook on the beach is great fun and lighter tackle can be used. Snook will cruise the surf line within a few feet of shore in search of a meal. These fish will spook, so a delicate presentation is required. Small white bucktail jigs are very effective, as are shrimp imitations and small plugs. Fly anglers score with white minnow patters such as the D.T. Special and Clouser Minnow. Most fly anglers find the idea of spotting a 28” fish in foot deep gin-clear water, quietly stalking it, presenting a fly and watching the take to be the pinnacle of fishing. Does it really get any better than that? That opportunity does exist from Tampa Bay all the way south to Marco Island. Best of all, very little gear or travel is required and a boat is actually a hindrance! Sight fishing for snook along area beaches is not a secret among local anglers, but it is not widespread knowledge throughout the country. But, that fact is that anyone with a little stamina to walk, a fly rod, the ability to cast 40 feet and a bit of patience can enjoy this experience. As in all fishing, there are nuances that will help fly caster be more successful. Snook begin migrating out of the back bays and onto the beaches in April, especially in the southern region, and are usually thick by June. They are out there to spawn, but will certainly take a well presented fly. In fact, fly fishing is probably the most effective approach as these fly lands so softly and the fish are in quite shallow water. The general weather pattern in the summer is for the wind to lay down around midnight, and blow lightly out of the ease or southeast in the morning. The beach should be calm with relatively little surf. Too much chop will stir the water up, making it very difficult to spot snook. By noon the sea breeze will kick up and it will continue to pick up throughout the afternoon. The technique is relatively simple. Get out on the beach around 7:30, no need to get there too early as it will be too dark to see any fish. Choose a section of beach that has few swimmers, though that usually isn’t an issue that early. The best fishing will be walking north, with the wind and sun at the anglers back. Armed with a 7wt to 9wt outfit, a long leader with a 25lb-30lb tippet and a #2 white D.T. Special, Crystal Minnow, or any small pattern, the angler heads out, walking 15 feet or so away from the water, with 40 feet or so of line coiled in his hand, ready to make a quick cast. This will give a good vantage point to spot fish. Most snook will be seen right in the surf line, withing a few feet of shore. There is very little structure on most beaches, therefore any rocks, pilings, or other structure can be very good spots. The same goes for beaches near passes, they can be fantastic places to fish. Otherwise, look for schools of bait fish or just seeing snook in the water. Snook will range from loners to quite large schools, but mostly commonly will be seen in groups of several fish. The angler needs to determine which way they are heading. If they are coming towards the angler, he needs only stop, wait for the fish, and present the fly ahead of them. Subtle strips work best. If the fish is heading away, most of the time they are moving slow enough that the angler can walk around and get ahead of them, then present the fly. As in all fly fishing, there will be refusals, but plenty of takes as well. Many of the fish are “schoolies” but there will be some trophy snook fish as well! Anglers may occasionally encounter redfish, jacks, msackerel, and other species as well. While the equipment requirements are minimal, there are a few things required to be comfortable and achieve success. A had, good polarized sunglasses, sunscreen, and water are a few essentials. Comfortable shoes that are still comfortable when wet are important as well. A fanny pack is practical for toting water, sunscreen, leader material, and some flies. Some anglers fin a stripping basket to be an invaluable tool, keeping fly line out of the surf and not under foot. While the walk back may be into the sun and wind, keep a sharp eye out. It is amazing how fish will suddenly appear! While sight casting to snook is the most glamorous opportunity, fly anglers do have options during other times of year, particularly in the spring and fall. A couple days of east wind will result in calm, clear water along the beach and this will bring in the bait and of course the gamefish. Spanish mackerel, bluefish, jacks, ladyfish, and other species will come within range of a decent caster. Clouser Minnow and D.T. Special patterns are solid producers. 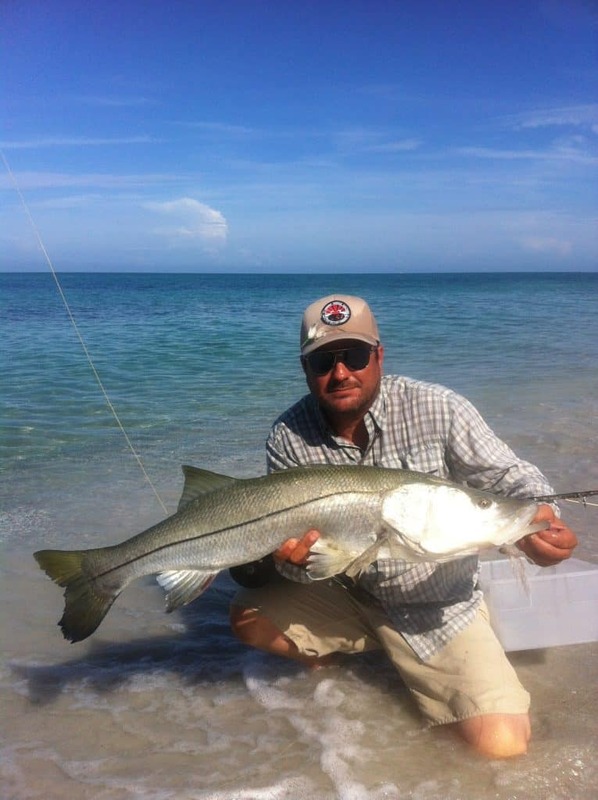 Spin anglers are not to be left out when trying to catch snook off the area beaches. Point of Rocks on Siesta Key and the mouths of both New Pass and Big Sarasota Pass on Lido Key are prime spots. As in fly fishing, a subtle presentation is important. Small white lures such as bucktail jigs, soft plastic baits, and plugs all work well. Anglers who prefer live bait will do well on Sarasota snook using large shrimp, pilchards, and pinfish. Keeping bait alive in the summer can be challenging. Most anglers are aware of the fact that many species of fish migrate along the Gulf Coast and are generally caught at certain times of the year. Spanish and king mackerel along with false albacore and cobia move through in the spring and again in the fall. Tarpon make their big push in the warmer months, starting in early May. Sheepshead are thick in late winter and spring. But, resident fish also make local migrations and none more distinctly that perhaps the most popular inshore gamefish in Florida; snook. So, let’s go through the annual snook migration pattern. The cycle begins in the winter, when snook have migrated up into creeks, rivers, and residential canals to escape the harsh conditions on the shallow flats. The more severe the winter, the more pronounced this movement will be. The water in these areas will normally be significantly warmer than the open bays, due to deeper holes, protection from the wind, and darker “tannin” stained water. I prefer casting shallow diving plugs for snook in this situation, they allow anglers to cover a lot of water fairly quickly and elicit exciting strikes! As the water warms up in the spring, snook will move out of the creeks, rivers, and canals and scatter out over the inshore bays. They will set up in their typical ambush spots that offer cover, current, and opportunities to feed. Mangrove shorelines with a depth change, grass flats with potholes, sloping oyster bars, docks, and bridges will all hold snook. At this stage snook can be taken using a variety of techniques; live shrimp and baitfish, plugs, soft plastics, and weedless spoons are all effective baits. Outgoing tides early and late in the day and at night are prime times. By early May, Sarasota snook will be staging heavily in the passes and at some point will move out onto the beaches to spawn. This is one of the easiest times of the year to catch snook, especially a trophy! Live pilchards are extremely effective, especially if a few freebies are tossed into the structure to get the fish excited. Live pinfish and large shrimp are also deadly. Artificial lures can be used successfully as well, though live bait really shines in this situation. By mid summer the beaches should be thick with snook. Areas with some type of cover such as rocks or pilings will be hold good numbers of fish. This is a fantastic opportunity to sight cast for snook using light spinning or fly tackle. Small baits that can be presented more delicately will draw the most strikes, white bucktail jigs and flies are a great choice. Live bait works very well, too. As it starts to cool, the pattern reverses itself as snook move back into the inshore waters and then eventually back into the rivers, creeks, and canals once it gets cold enough. Anglers who take the time to learn and understand local fish movements will enjoy success on a more consistent basis. Anglers can check the ever-changing snook regulations on the FWC site. Winter is a great time to catch snook in Sarasota! Snook migrate up into creeks and residential canals when the water cools off. They do this to escape the open bays. Water in creeks, rivers, and canals are often significantly warmer. Forage migrates into these areas as well. Best of all, it concentrates snook into smaller areas. This makes them easier to locate. I like casting plugs when Siesta Key snook fishing in the cooler months. Plugs allow anglers to cover a lot of water fairly quickly. They also do not snag the bottom. Finally, the hook-up ratio is good with the pair of treble hooks. Speaking of which, care needs to be taken! Some plug manufacturers use single hooks on their plugs as well. My favorite plugs are the #10 Rapala BX Minnow and the Jointed BX Minnow in gold and Firetiger. Phillippi Creek is a reliable snook spot in the winter. The grand Canal on Siesta Key also offers anglers miles of docks, seawalls, and other structure. Snook will be found here all winter. Large jack crevelle will be taken there as well. Trolling plugs is a great technique to use. It will both locate and catch fish. There are several rivers that are close to Sarasota and Siesta Key. The Manatee River, Braden River, and Myakka river offer anglers a unique experience. The scenery is awesome as is the fishing. Clients have the chance to catch a trophy snook in a cool setting. This is a relaxing charter with a “freshwater” feel to it. I use my 14′ Alumacraft Jon boat for this fishing. A river snook fishing charter is a good option for experienced anglers. These rivers are a 30 minute to 45 minute drive from the area beaches. But, it will seem like a world away! The Myakka River is especially remote-feeling. It is one of the two designated “Wild and scenic” rivers in Florida. In conclusion, the next time you are visiting the west coast of Florida, give Siesta Key snook fishing a try. You might just hook the fish of a lifetime!